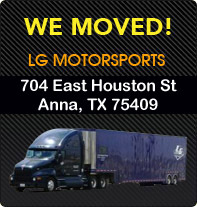 At LG Motorsports our saying is: &#39We Race - You Win&#39 and that is why we built the product that we have here. We have always had our G2 Bilstein/Hyperco coil-over shock package, but many of our customers wanted an adjustable shock, so we went to work to make a first-class package just the way I would want it for a race car without welding new mounts in place. This is what we came up with and we did it with no compromises.There are other coil overs out there but they are full of compromises. We did our best to avoid the compromises. We have a spherical bearing set up on our shocks in all mounting locations other than the bottom of the rear shock "Fork" mount. We did this because of the precision that the bearing offers. Precise and smooth operation that does not interfere with the shock function. Spherical bearings are the best option for coil-over mounts. Rubber mounts cause a "Trampoline" effect that must be overcome before the shock can actually work. Rubber also changes the spring rate momentarily until fully compressed. 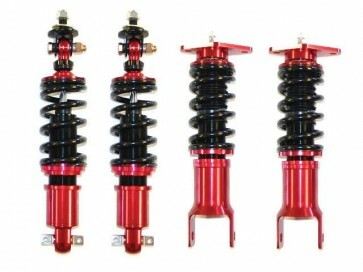 In addition, rubber causes side loads in the shock rod and will eventually damage the shaft. Plastic or Delrin eliminates the "rubber/trampoline" effect, but it introduces new friction that interferes with the operation of the shocks. Forces are forces and the friction involved in a Delrin/plastic mounting system introduces "Hysteresis" losses that interfere with your shock operation. One more added benefit that you do not see on other adjustable shocks, is our remote for the rear shock adjuster. There is a slight gap at the upper shock mount in the rear that the cable can fit through so you do not have to drill any holes to get to the adjusters!